Sjors & Panorama magazines. Dutch. Panorama was and is a magazine with all kind of information, hardly any comics in fact. But in the early days they did have a special comic attachment to the magazine; called Sjors. Later Sjors did go their own way and became a famous comic magazine in Holland and Belgium for years. 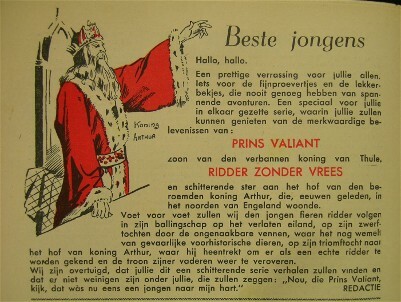 This publication of Prins Valiant is the oldest in Holland & Belgium. Below you can read the official introduction for the serie in the Sjors issue of 18th of Aug 1938.